I remember coming across this site a few months back, and I’m glad that I rediscovered it again recently. 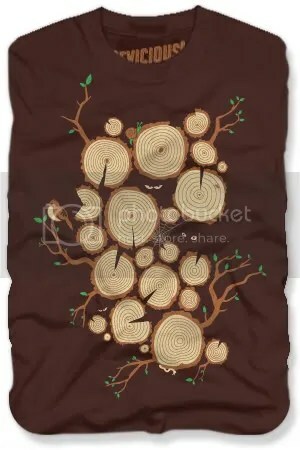 Devicious has some sweet new tees out, and the one that I’m particularly fond of is called “Slice of Woods.” Now I’m no fan of deforestation (especially if it’s anthropogenic), but this tee is simply beautiful to look at! I love how there are some random organisms moving about on the tree stumps and how there are also animals lurking in the darkness below. You can pick up “Slice of Woods” for $18 at Devicious. They’re also having a holiday sale right now, so you can take 25% off your entire order with the code “hohoho“! 4 Responses to "Slice of Woods"